Maya Malioutina’s resplendent paintings are informed and influenced by the Japanese School of thought, Wabi-Sabi, a philosophy that embraces the idea of finding beauty in imperfection especially amongst natural settings and their inherent authenticity. Wabi-Sabi emerged in 15th Century Japan as a reaction to a contemporary trend of luxury and ornamentation. One could certainly argue that this has relevance and importance in our consumer and technology driven culture. Rikyu is the individual thought to have originated this philosophy and is admired in Japan for his contribution. Much like in today’s world where the adulation of technology and luxury is rampant, the idea of Wabi-Sabi is timely and refreshing. This is certainly one of the reasons why Malioutina’s work is so inspiring, rejuvenating and alluring to the contemporary viewer. Maya Malioutina’s beautiful paintings are about embracing the imperfect, impermanent and incomplete. A wall with peeling paint, rusted undertones, and a rough texture, forgotten and overlooked has so many stories to tell. The works are alluring as a result of this and one has a deeper appreciation and interest with the understanding of the precepts and the acceptance of Wabi-Sabi. The end results in the individual basking in the glow of these works as well as a primal interest in actually touching them and interacting with them. Malioutina’s work is also influenced by the Japanese Kintsugi Method of repairing ceramics. In this method the repair’s goal is not to disguise that there is an imperfection or need for a repair but to use precious materials such as gold, silver, or platinum to enhance the original and elevate it to another level of beauty by enhancing the original and its history. With the artist following and incorporating aspects of both Wabi-Sabi and Kintsugi, the work has an inherent beauty as well as an appreciation for things that are both beautiful and multilayered. 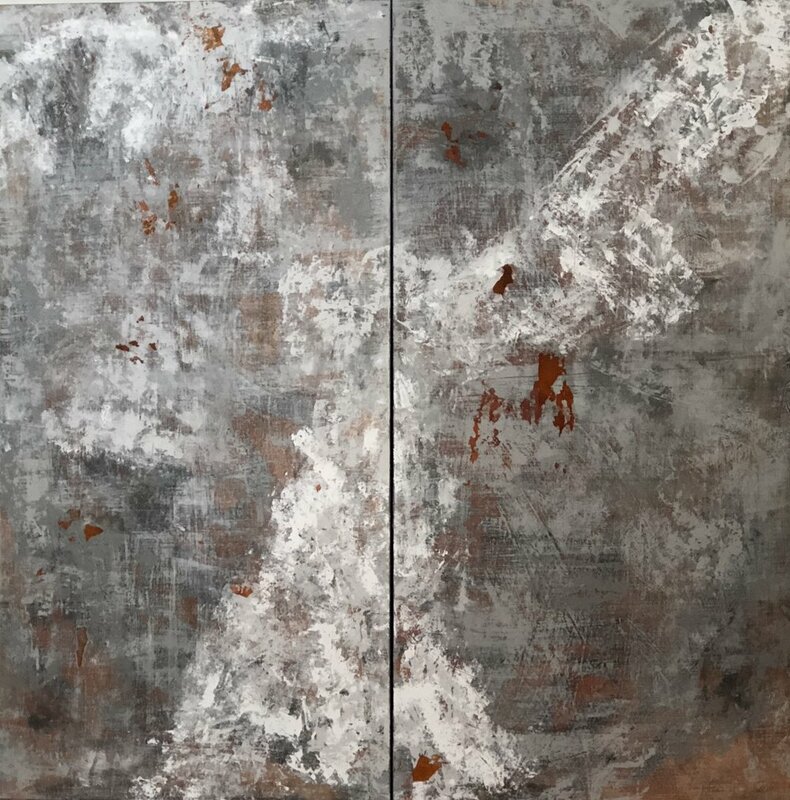 Erosion, Oxidation, peeling paint, rust, and bare boards all serve as a kind of poetic personal journey evoking the etched markings of wrinkles and scars. The paintings are all about texture. Everything appears highly tactile and three dimensional. Light is not reflected, but comes from within, permeating every layer, as it creates the narrative of aged surfaces. The creation of the work is a slow and patient process that involves many layers. Each piece requires anywhere from ten to forty layers before it matures. Viewers are invited to develop their relationship with the paintings as they allow themselves to be transported and experience what lies beneath and beyond them.